On Friday 28th April 2017, the Bureau of the Parliamentary Assembly of the Council of Europe resolved that it had no confidence in Pedro Agramunt as President of the Assembly. It further resolved that Mr Agramunt is not authorised to undertake any official visits, attend any meetings or make any public statements on behalf of the Assembly in his capacity as President. This decision is a consequence of the President´s visit to Syria and his rejection to take any political responsibility. Due to the critical situation that resulted from the President´s visit to Syria last March, damaging the reputation and the credibility of PACE as a whole, the Socialist Group had already during its group’s meeting on Monday 24th April, decided that serious steps had to be taken. 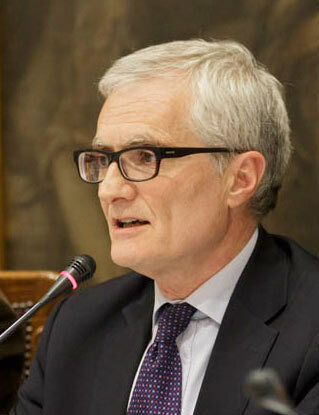 Mandated to raise a point of order calling for the resignation of the President, our Chair Michele Nicoletti found strong words in the opening of the Plenary, saying about the visit to Syria: “We believe that political responsibility has to be taken for that action…… for that reason we call for him to be removed from his office as President of the Parliamentary Assembly. We are making this appeal because we believe that the seriousness of the mistake must be matched by the seriousness of the consequences”. It has been a hard decision, but the Socialist Group thought that as the reputation of our Organisation was put at risk, a strong reaction was needed. This position was shared, since other political groups and different members of the Assembly raised the same issue. The next day, a public hearing pertaining to the trip to Syria took place, as proposed by European People‘s Party Group’s leader Mr Fischer “during which questions will be posed and responses heard”. The unsatisfying replies of the three members who participated in this trip, namely PACE’s President Mr Agramunt, ALDE’s President Mr Xucla and Legal Affairs Committee’s Chair Mr Destexhe, raised even more the tension in PACE. The explanations given by Mr Agramunt couldn’t restore the necessary confidence and repair the damage caused to our Assembly. At the end of the week Session, the representatives of the five political groups in the PACE Bureau’s meeting agreed unanimously that the confidence in the President was lost and therefore his resignation should be asked. It further resolved that Mr Agramunt was not authorised to undertake any official visits, attend any meetings or make any public statements on behalf of the Assembly in his capacity as President. “The President chose not to attend the Bureau today, and has not presented a letter of resignation. As a result, and in the context of the current Rules of Procedure under which the President cannot be compelled to resign, the Bureau felt it necessary to take these steps,” stated the Senior Vice-President of the Assembly, after chairing the Bureau meeting. Furthermore, the Bureau decided to refer to the Committee on Rules of Procedure, Immunities and Institutional Affairs in order to prepare as soon as possible a report on recognition of the principle of accountability and its implementation. It should fill the lack of written rules and of mechanisms, namely a procedure of impeachment or vote-of-no- confidence procedure, to ensure the duty of accountability of its members holding leading elective offices, such as President of the PACE, Vice-president or committee chair. Although we deeply regret the turnout of these unprecedented events in our Assembly, our Group feels that we had to react in this way as an act of political responsibility in order to protect the reputation, credibility, honour and integrity of our Institution.